We were planning on going for a curry tonight, and had decided to go to an Indian restaurant near the hotel that seemed to have some of the best reviews in Newark, but once we got there we discovered that it didn’t serve alcohol. Friday night, curry, without beer? It just didn’t seem right. So we decided to have a walk to a part of Newark we hadn’t visited before, on the hope that one of the restaurants we’d found on the Internet turned out to be OK.
We found the pizza place first. It had a cheesy name (‘Love At First Slice‘), and looked a bit basic (you place your order at a hatch, then take your number and your beer and find a table), but the pizzas sounded nice, they had draught beer, and it looked like a band was just getting set up, so we decided to give it a go. To make the most of our expenses, we got one XL pizza, two pitchers of beer, and a plate of jalapeño poppers to share as a starter. 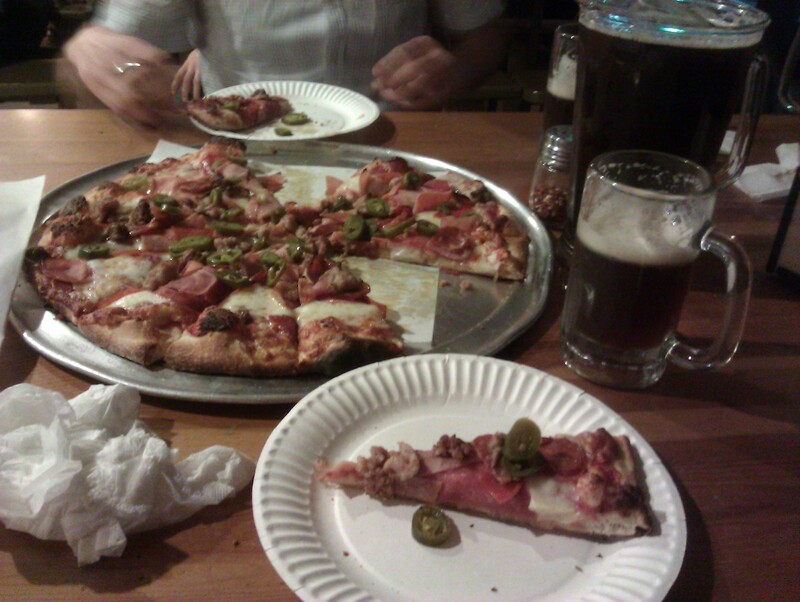 We probably could have done without the poppers, and a slightly-smaller pizza would almost certainly have been enough, but somehow it all got eaten, and the beer all got drunk (plus a bit more). The bands were pretty good, too. Late Night District were the support act: guitar, bass, drums, sort of alternative-rock, American-style punk rock. Brolly were the main act, a bit more polished, vaguely like Radiohead-ish: two guitars, bass and drums, plus assorted other instruments and percussion depending on the song. I’m not sure how, but I think I ate about two-thirds of that pizza. I really should know better by now.